Up until the 1st Test in Dubai, Usman Khawaja had averaged just 13.75 in the tour of Sri Lanka in 2016. His non-involvement in the playing XI in any of the match in the tour of India in 2017 along with managing just a single in either innings in the only match he played in Bangladesh later that year, largely overshadowed his impressive average in 2015. His dismal stats in Asia gave way to batsmen like Peter Handscomb, Glenn Maxwell, Matt Renshaw being given more preferences. His lousy running between the wickets had added to his woes too. The figures in subcontinent also proved that Khawaja's participation for the upcoming matches, especially in Asia was in doldrums, if not entirely put to rest. When he was dismissed by Moeen Ali at Gabba in the first Test of the Ashes 2017, it marked the 17th time that he was out to a spinner in 39 Test dismissals. 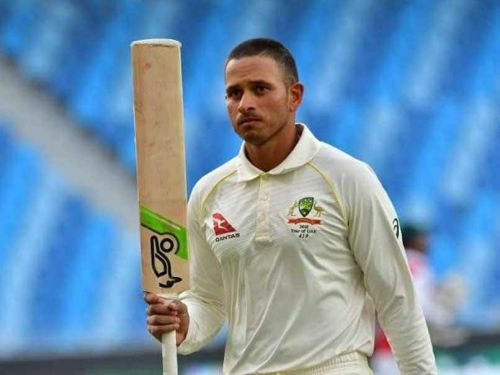 With Australian cricket marred by the ball-tampering scandal, Khawaja was no longer a doubtful starter to play Pakistan in the UAE in absence of David Warner and Steve Smith. Pakistan had Yasir Shah, Mohammad Hafeez and the unfancied bowler Bilal Asif waiting to replicate the series success of 2014. In the first Test, Khawaja was slotted in the opening position along with the debutant Aaron Finch. The opening pair had been astounding by adding 142 runs in reply to Pakistan's 482 before a less than familiar Australian collapse took place. The visitors lost a stunning ten wickets for just 60 runs thus crashing for 202 and thereby handing a lead of 280 runs to Pakistan. In their second innings, Pakistan piled further misery on Australia by adding 181 runs more to lead to give the visitors an improbable target of 462. Chasing the target, Australia lost three wickets by the end of fourth day's play and a defeat was on the cards for them. The pitch which was as good as a freeway road on the day one and was expected to get slower and lower as the game progressed. However, one couldn't argue that Australia's fragile middle order and their woes against spin couldn't have gone worse in their first innings and were expected to be steamrolled in their second innings. However, Usman Khawaja's determined, solid and inspirational innings, carrying the team's hopes of survival on his shoulders, enabled Australia to secure an unlikely draw in the first Test. Before the start of the series, Khawaja had been working ruthlessly on his fitness level in order to remain neck to neck with the scorching heat in the desert. Between the time when Australia’s infamous tour of South Africa concluded and the first Test in Dubai, he had cut down a stunning seven kilos by training immensely hard. Justin Langer’s unshakable backing up of Khawaja was yet another reason why Khawaja thrived and thwarted his demons. When the pitch got tougher to bat, that is where Khawaja raised his game and looked more comfortable. He batted for a combined time of 767 minutes, scoring 226 runs off 477 deliveries, negating the spin duo of Bilal Asif and Yasir Shah smartly. It would be barbaric not to make a mention of the batting efforts by Travis Head, Nathan Lyon, Aaron Finch, and the skipper Tim Paine. Australia may have evaded a confidence shattering loss, but, it comes with a whole lot of concerns ahead of yet another trial by spin in the ongoing second Test. Usman Khawaja’s resurgence and his partnership with Aaron Finch were the silver lining in both the innings of the first Test. Australia’s fragile middle order need to come together in the absence of Steve Smith to combat Pakistan’s spin bowling combination and a tough Indian tour of Australia to follow.